Having been swallowed by Psi's dragon, Supergirl is trying to help her and get Batgirl, Ben Rubel and herself out of the Phantom Zone. 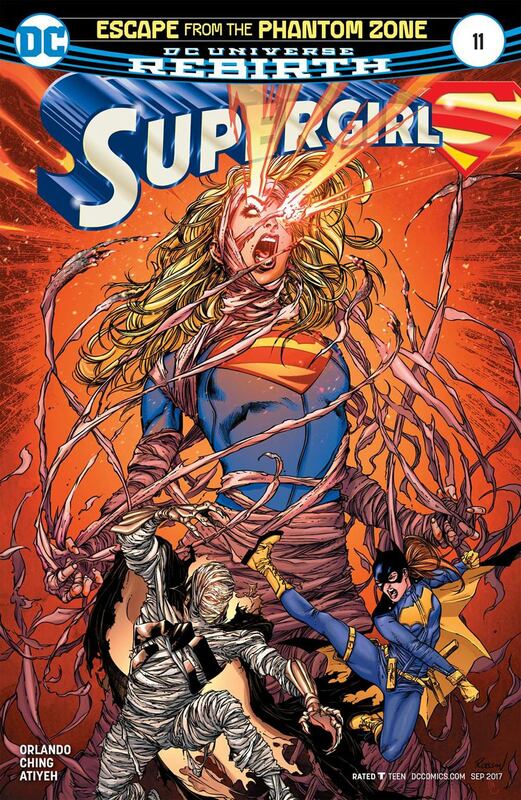 While Ben and Batgirl fight Xa-Du and his army of criminals, Kara Zor-El must convince Psi to not go through with her plan to exterminate Xa-Du and destroy the Phantom Zone. If our heroine doesn't succeed, Psi will journey into a darkness from which she may never return. A nonlethal stun beacon in Ben's hands helps him deal with the Phantom Zone prisoners while Batgirl fights Xa-Du head on, knowing he's not at full power. It is during this fight that the Kryptonian villain reveals that he was using his soldiers as a means for his escape. This angers them. However before they can react, Supergirl and Psi intervene. The latter is now a key to the Phantom Zone, and thanks to Kara Zor-El persuading her to do the right thing, she will make the inter-dimensional prison a place of rehabilitation instead of one of punishment. 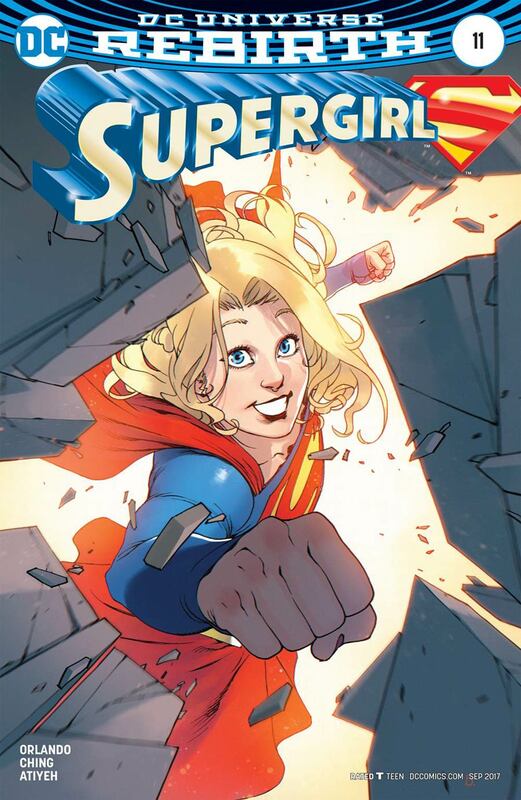 With that, Supergirl, Batgirl and Ben are brought back to Earth with Batgirl telling the Girl of Steel that if she ever needs another hand with Xa-Du or the Phantom Zone, she'll be there to help. Cat Grant has sent a "Supergirl Signal" to Kara via the CatCo app. Having seen the numbers on social media and other outlets while Supergirl was in the Phantom Zone, Cat's trying to find a use for her, which she says she cannot. Cat fires a Kryptonite gun at the Lost Daughter of Krypton. Kara Zor-El is falling to her death. Will she be able to save herself before becoming street pizza? What's come over Cat Grant? Will the next issue be the final one of this series? Be here next month, Same Super Time, Same Super Site to find out, Superfans, if you dare. Story - 5: Since this story arc began, this series has been fun to read. This issue in particular was a treat. Maybe that's because I've always loved Phantom Zone stories ever since I was my nephew's age. Admittedly, that could be coloring my view on this book, but I thoroughly enjoyed every moment of this last chapter. That last page was one of the greatest "What the &$%�?" moments in the series. I'm sincerely impatient to see what happens next. Cat's shooting Kara left me with the same shocked expression I had reading Walking Dead #100. Hurry up with the next issue, DC. Art - 3: Again, Ching's strength as an artist lies in his scenes that take place in the Phantom Zone. The pages on Earth are poorly rendered in my opinion. This worries me about the next issue's visuals when the next serial begins. Cover Art - 4: Why the heck isn't the cover art team not drawing the interiors for this issue, or this series for that matter? It's a great blend of creepy horror and superhero action that makes people want to buy the book.